1Faculty of Geosciences, Geotechnique and Mining, TU Bergakademie Freiberg, Bernhard-von-Cotta-Str. 2, D-09599, Freiberg, Germany. 3 Universitas Palangka Raya and CIMTROP, Jalan Yos Sudarso, Palangka Raya, 73112, Central Kalimantan, Indonesia. We evaluated the potential of different low cost SAR scenes from the Advanced Land-Observing Satellite (ALOS) on board the Phased Array L-band Synthetic Aperture Radar (PALSAR) and the Advanced SAR (ASAR; C-band) on board the Environmental Satellite (ENVISAT) for the monitoring of forest threats (i.e. deforestation and degradation). 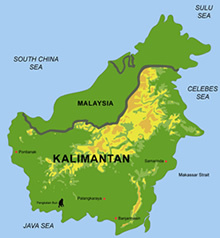 As a test site we selected the Sabangau National Forest (SNF) located in Central Kalimantan (Indonesia). In the period of April 2007 and April 2011 all available quad-polarization PALSAR (i.e. five scenes) and dual-polarization ASAR (i.e. ten scenes) were selected for this investigation. The motivation was the availability of airborne Light Detection And Ranging (LiDAR) acquired on August 2007 and 2011 as well as high spatial resolution aerial Hasselblad photographs from August 2011 that were used for validation purposes. The SAR data were multi-looked, geocoded at a spatial resolution of 30m and finally converted to backscattering coefficients. Polarimetric features, decomposition techniques and interferometric coherence were also extracted from the datasets. Since an effective monitoring system at a regular basis does not exist in Central Kalimantan, a simulation of the presence and absence of optical Landsat according to the SAR datasets was also evaluated. Landsat images were atmospherically corrected and converted into surface reflectance. We precede with a visual interpretation over the SAR scenes taking into account the temporal changes in the backscattering coefficients and the variations of the scattering mechanism (i.e. surface or volumetric scattering). Relatively large deforested areas were identified from 2009 to 2011. Landsat was unable to detect early deforestation stages due to the frequent cloud coverage bringing late response in a simulated deforestation system. 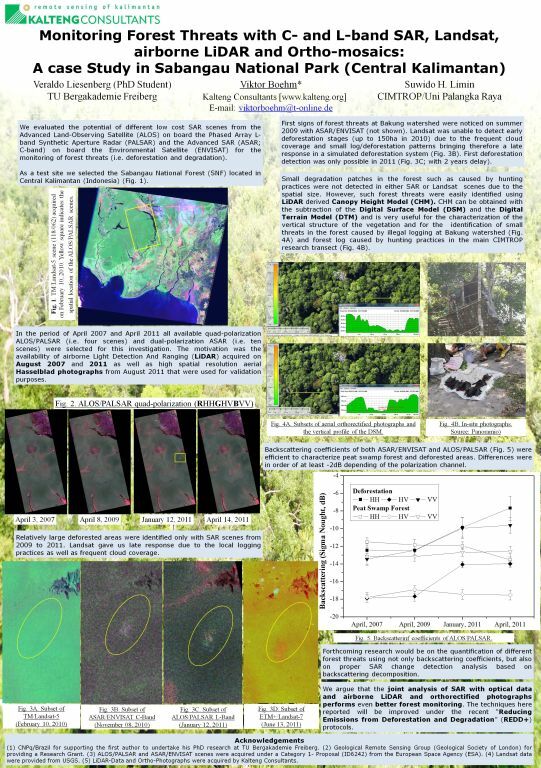 LiDAR derived Canopy Height Model (CHM) and Intensity as well as high resolution photographs were useful for the characterization of the vertical structure of the vegetation and for the identification of small threats in the forest caused by illegal logging and hunting practices in the main CIMTROP research transect. Small degradation patches were not detected in either SAR or Landsat scenes. We argue that the joint analysis of SAR with optical data and airborne LiDAR and orthorectified photographs performs even better forest monitoring and thus encourage the further development of joint techniques. The techniques here reported will be improved under the recent “Reducing Emissions from Deforestation and Degradation” (REDD) mechanism.